Being an expectant mother is a stressful enough time without having to concern yourself with every little bite you put in your mouth. So don’t worry yourself unduly, after all, there’s no one ‘right’ diet for pregnancy. 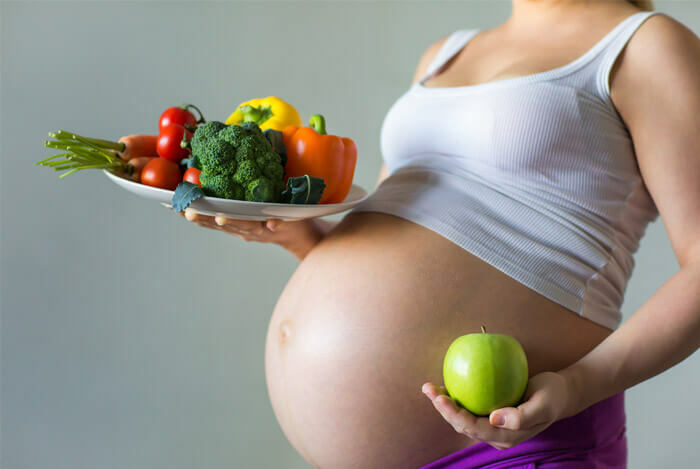 In fact, a healthy pregnancy diet looks pretty much like any other healthy diet – full of lean protein, complex carbohydrates, healthy fats, vitamins and minerals. There are a few vitamins and minerals you need to place extra importance on though. Let’s have a look at those before we get to some of the best baby-building foods around. Now that we’ve got those covered, read on to discover 14 of the best food sources for getting more of these important nutrients, for baby’s health, and yours! Bananas are rich in nutrients that will benefit both mother and baby throughout the pregnancy. One medium fruit contains 3 g of fiber, 10.3 mg of vitamin C, and 0.4 mg of vitamin B6, as well as smaller amounts of other nutrients. 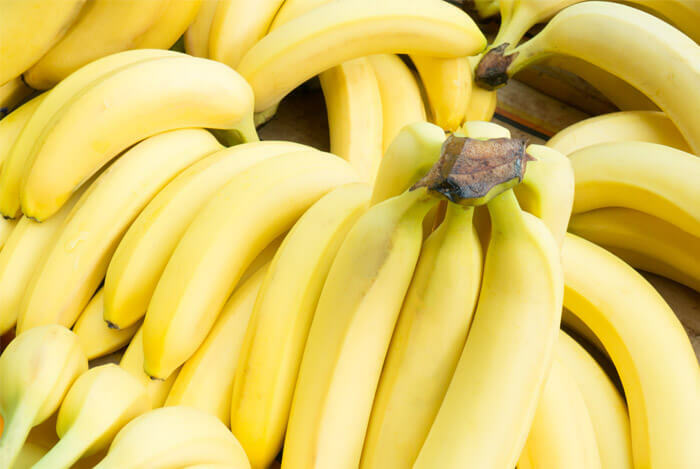 At over 21% of your vitamin B6 needs, bananas are a great food to snack on during pregnancy. Vitamin B6 is important for your baby’s developing brain and nervous system. It also helps your body form new red blood cells and antibodies. Research suggests that vitamin B6 (also known as pyridoxine) can be effective at reducing nausea and the symptoms of morning sickness in some women. One study, carried out in 1991, saw 31 women take a vitamin B6 supplement every 8 hours. Another 28 women received a placebo. After three days of supplementing, only eight of 31 patients (26%) in the vitamin B6 group experienced any vomiting, compared with 15 of 28 patients (54%) in the placebo group. A second study, carried out four years later, followed 342 women. Some were treated with B6 and others a placebo. Researchers found that those on the vitamin B6 supplement experienced a reduction in nausea, although there was no statistically significant reduction in vomiting incidences. Whether they help with your nausea or not, bananas are still a nutrient rich (and delicious) fruit and are a good option for pregnant women to enjoy. I like bananas sliced on oatmeal, or as a topping on wholegrain toast with some almond butter. They’re also a great portable snack to carry with you for when hunger hits. Lentils are an incredibly nutritious food, especially in pregnancy as they’re full of iron, protein and B vitamins. They’re particularly high in the important nutrient folate. 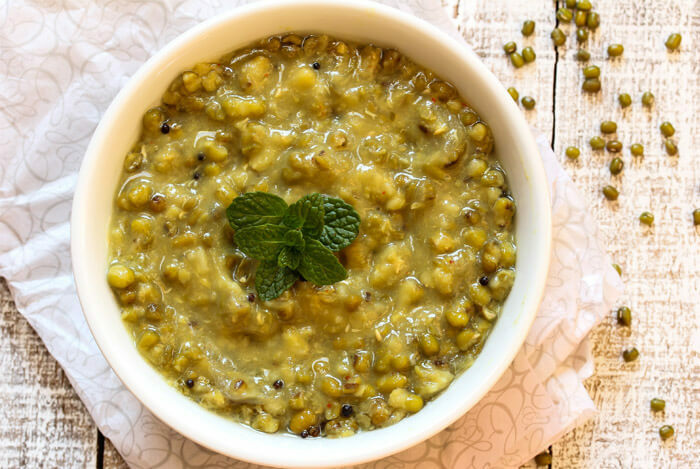 One cup of cooked lentils contains 358 mcg of folate – around 60% of a pregnant woman’s needs. Research from the Centers for Disease Control and Prevention (CDC) has shown that taking folic acid (folate) before getting pregnant and in early pregnancy lowers the risk of having a baby with certain birth defects. In the mid-1990s, the CDC and the Peking University Health Science Center (PUHSC) tested out the effects of folic acid before and during early pregnancy in Chinese women. When folic acid was taken daily, the risk of having a baby with neural tube defects (NTD) dropped 85% in high-prevalence areas and 41% in areas with prevalence similar to the United States. You’ll also be getting 6.6 mg of iron (around 24% of your daily needs) from a serving of delicious lentils. Just like lentils, beans are another great pregnancy pulse. In fact, these lean protein sources give you plenty of bang for your buck, whether pregnant or not. 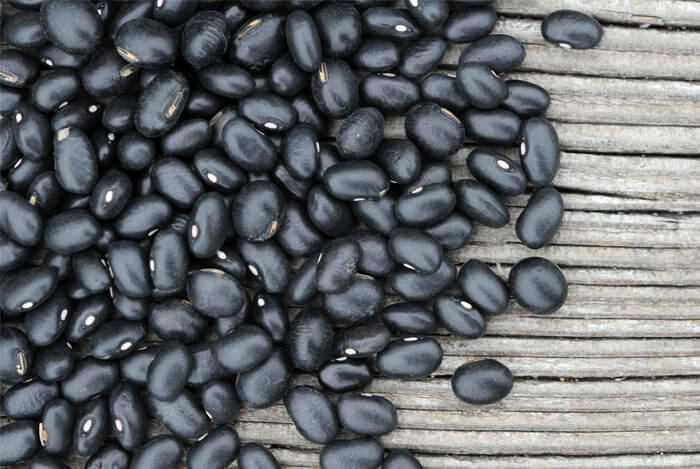 One cup of cooked black beans contains around 256 mcg of folate, 38% of your daily needs of manganese and 30% of magnesium. Although not quite as impressive as lentils when it comes to iron content, these beans still pack in a decent amount at 3.6 mg or 13% of your daily needs. You’ll also be getting 15 grams of protein, 21% of your recommended daily intake. Protein is crucial for your baby’s growth, especially during the second and third trimesters, says the Mayo Clinic. In addition, beans are a low glycemic index (GI) food, meaning they release energy slowly after consuming them. Some studies have shown that a low GI diet may be helpful during pregnancy. Women who ate a high GI diet were more likely to have heavier babies, and a higher weight in relation to height/length (ponderal index). Researchers concluded that, because birth weight and ponderal index may predict chronic disease in later life, a low GI diet may favorably influence long-term health. However, until further studies are done, a low GI diet cannot be recommended over current guidelines, although including some low GI foods, such as beans, may be helpful. 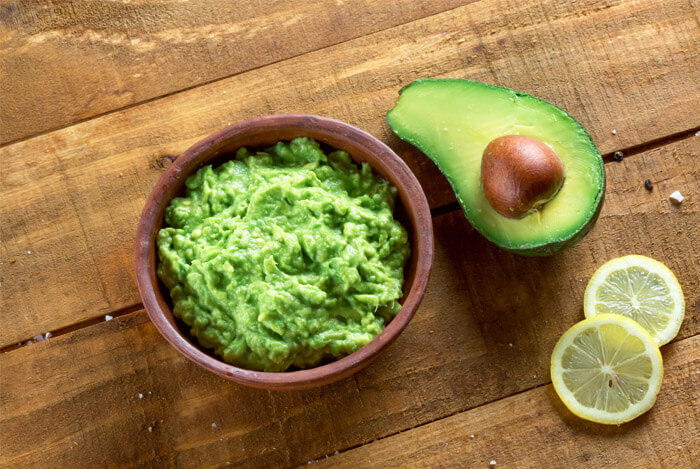 Avocados are full of heart-healthy monounsaturated fats. One avocado also contains 25% of a pregnant woman’s daily requirement of vitamin C, 26% of vitamin B6 needs, 27% folate and 28% of vitamin E needs. While not all seafood is safe to eat during pregnancy (due to high mercury levels), certain types are great for your growing baby. Wild salmon is probably one of the best options for expectant mothers, after all, it’s an incredibly healthy food. Salmon is an excellent source of protein, iron and zinc, all of which are vital for your baby’s growth and development. 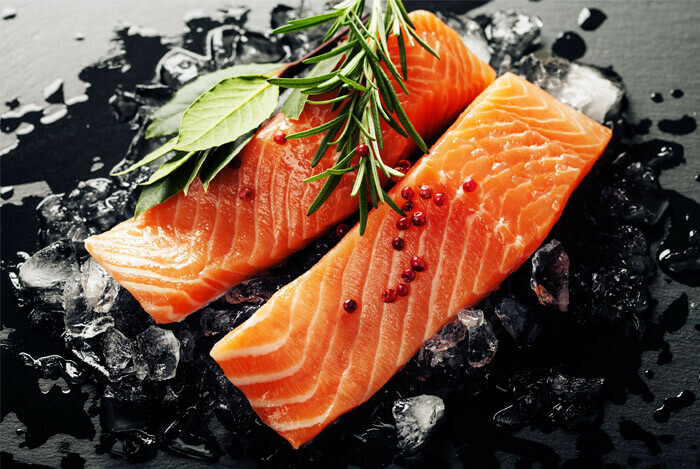 What’s more, it contains plenty of omega 3 fatty acids. Observational studies have found that consuming omega-3 fatty acids during pregnancy is associated with improved neuro-developmental outcomes in the child. The FDA recommends that pregnant women can safely eat up to 12 ounces of low-mercury fish, like wild salmon, every week. Oatmeal is healthy for almost everyone, and that includes expectant mothers. 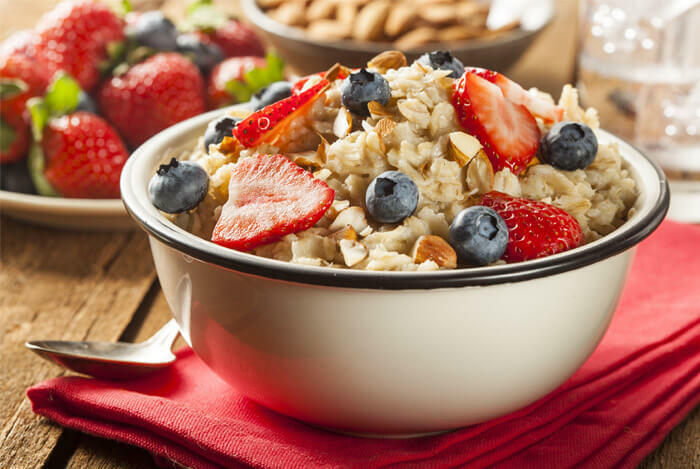 Not only is a bowl of comforting oatmeal filled with folic acid and iron, but it’s a fiber-filled food – great for relieving the common pregnancy symptom of constipation! According to the American Pregnancy Association, one of the main causes of constipation during pregnancy is a lack of fiber in the diet. One cup of cooked oatmeal contains 4 g of fiber per serving, that’s around 16% of an average person’s recommended daily intake. Stir a tablespoon of ground flaxseeds into the mix, and top with a half cup of blueberries, and you’ll have just doubled the fiber content! Almonds are loaded with nutrients. 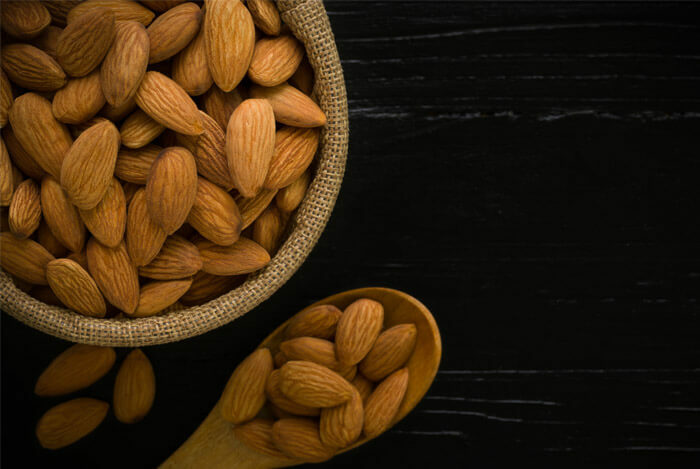 Just one ounce of almonds supplies about 1 mg of iron, 75 mg of calcium, 14 mcg of folic acid, 6 g of protein and 3.5 g of fiber. You’ll also get 7.4 mg of vitamin E, around half your daily requirement. Vitamin E is a potent antioxidant, and it also helps the body make red blood cells and prevent premature aging. But, in this case, it’s best to get vitamin E from food instead of supplements. While water isn’t really classed as a ‘food’, I thought it was important to include on this list because staying hydrated during pregnancy is vital. It’s recommended that pregnant women drink about 10 cups of fluids daily. For more about the incredible health benefits of drinking water, check out this post. Greek yogurt has around twice as much protein as other types of yogurt, something that is crucial for the development of your baby. 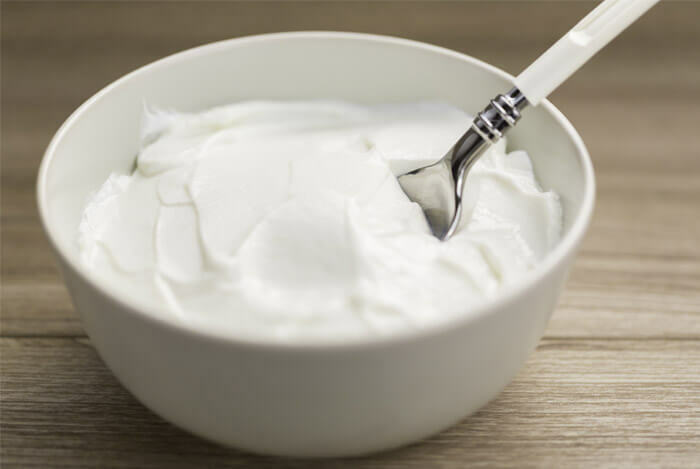 One cup of fat free Greek yogurt can contain up to 20 g of protein, 28% of your daily needs, and 25% of your daily dose of calcium. It’s also a great source of sustained energy for you! Greek yogurt is perfect for a ready made breakfast – simply whip up a batch of overnight oats or a chia bowl before bed. You’ve probably heard by now of the benefits of probiotics and healthy gut flora. Well, maintaining a healthy balance of bacteria in the body is even more important during pregnancy, as it’s possible the balance of gut bacteria in a mother may influence the baby. 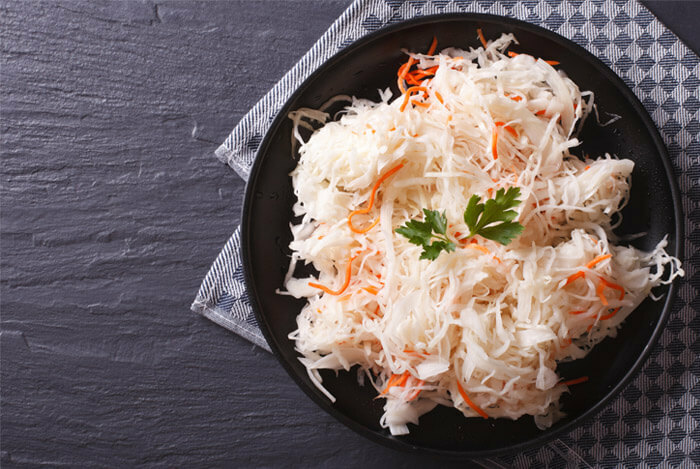 Eat a variety of fermented foods (like sauerkraut, kimchi and miso) and probiotic rich yogurts on a regular basis for good gut health. Certain fruits and vegetables contain beta-carotene (an antioxidant and type of carotenoid) which our bodies convert to vitamin A. We only convert as much as our bodies need, so there is no risk of getting too much vitamin A and suffering its toxic side-effects. 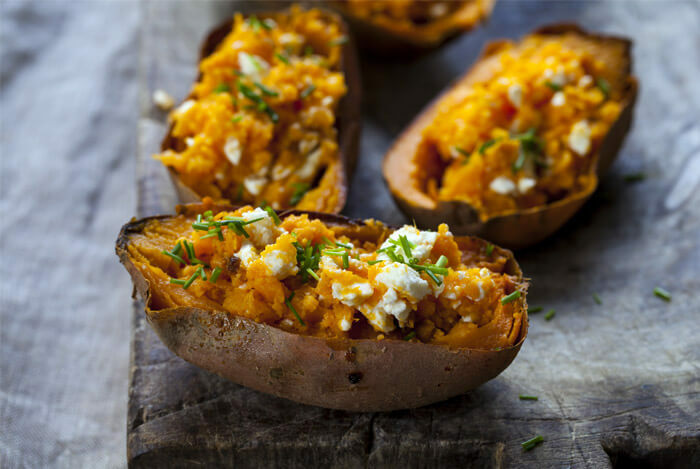 One such vegetable rich in beta-carotene is the delicious sweet potato. One medium baked potato has more than your day’s vitamin A requirement. Carrots are another beta-carotene rich choice. We’ve already established that spinach is an all-round superfood! Pregnant women can rest assured that spinach is a welcome food during pregnancy – it’s rich in folate, iron, vitamin A and calcium. Both you and your growing baby need calcium for strong bones and teeth, and well-functioning circulatory, muscular and nervous systems. 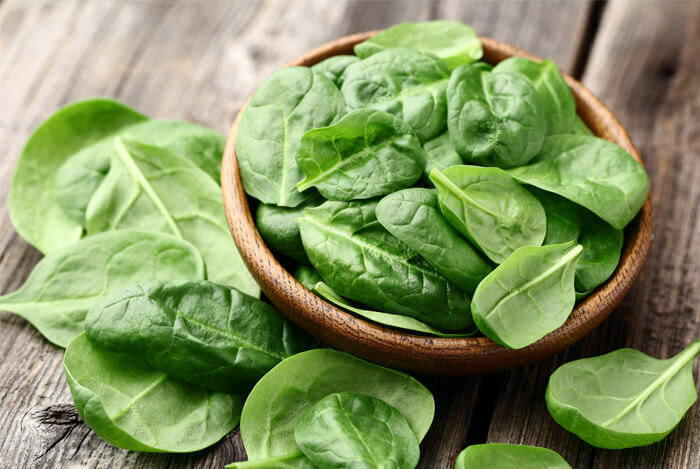 A cup of boiled spinach contains 245 mg of calcium, that’s 25% of the recommended intake during pregnancy. Season it with herbs or spices instead of salt though because research shows that if you eat a high sodium diet you’re raising the amount of calcium you excrete from your body through your urine. Crunchy, juicy bell peppers are a powerhouse of vitamin C. One large pepper (yellow, red or green) contains more than your daily dose. A powerful antioxidant, vitamin C has been found to help form a healthy placenta and contribute to normal fetal development. Animal research from 2012 also found that maternal deficiency in vitamin C may have serious and irreversible consequences for the baby’s brain. 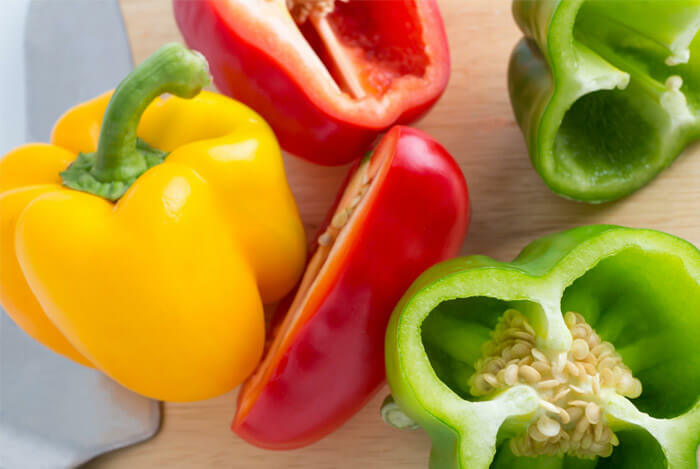 One yellow bell pepper also provides 2 g of both fiber and protein and 16% of your daily B6 needs. 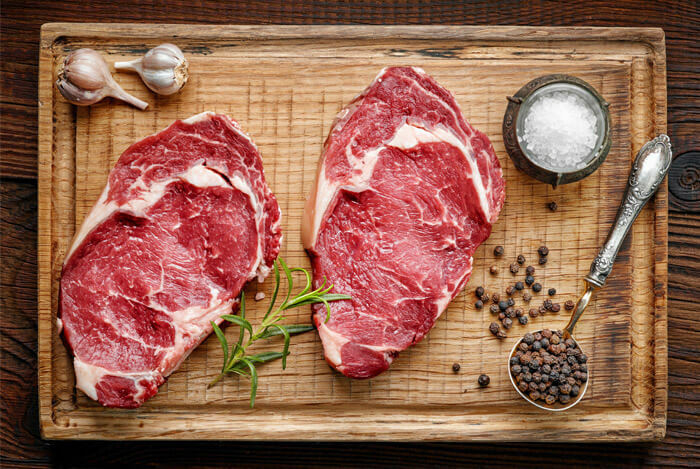 Lean meats are good sources of protein for pregnant women, which helps stabilize blood sugar levels. They also tend to be reliable sources of iron, helping you stave off anemia. Anemia during pregnancy is pretty common, which isn’t surprising when you hear that your blood volume can increase by up to 50% when you’re expecting! You might become fatigued and more susceptible to infections. You also increase the risk of preterm delivery and low birth weight. Iron is also important for the baby as it helps strengthen nerve connections in the brain. A 3 ounce serving of roasted lean beef tenderloin will provide 2.6 mg of iron. While lean meat is fine, I recommend you stay away from processed meats for the most part. What’s your take on the best foods for pregnancy? Have anything else you’d like to share? Let me know in the comments below!